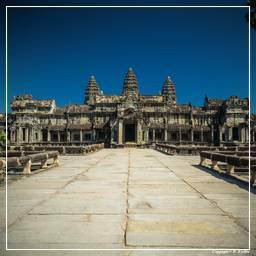 Cambodia (ព្រះរាជាណាចក្រកម្ពុជា), the successor state of the once powerful Hindu and Buddhist Khmer Empire, has an area of about 180,000 km², sharing border with Thailand in the north and west, Laos in the north-east, and Vietnam in the east and south-east. The lacustrine plain, formed by the inundations of the Tonle Sap (Great Lake), measures about 2,590 km² during the dry season and expands to about 24,605 km² during the rainy season. The kingdom’s capital and largest city is Phnom Penh.